LENTERA HUKUM is a triannual peer-reviewed open access academic journal which publishes works on all disciplines of law, including cross-disciplinary legal studies. The objective of the Journal is to provide a leading forum for enhancement of communication between researchers and policymakers on the recent development of law and promote the development of the newly cultivated research fields related to legal issues. 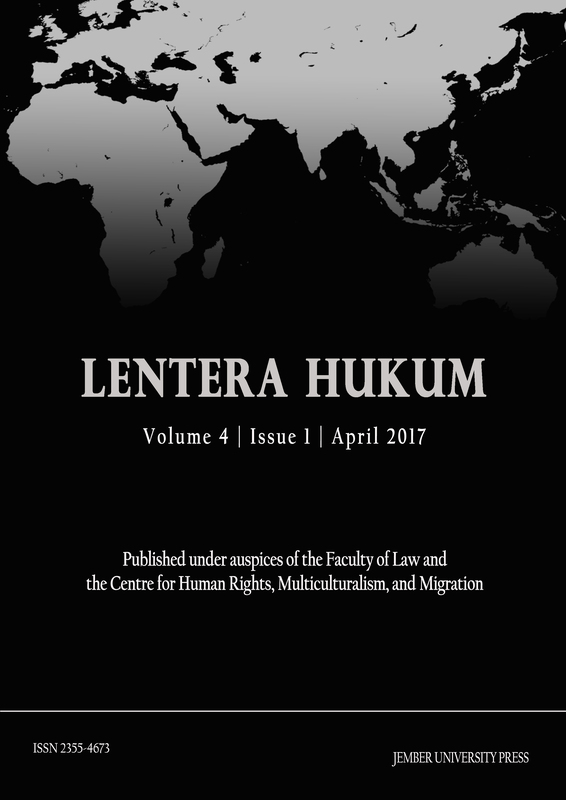 LENTERA HUKUM is a scholarly forum which publishes works on all disciplines of law, including cross-disciplinary legal studies. The objective of the Journal is to provide a leading forum for enhancement of communication between researchers and policymakers on the recent development of law and promote the development of the newly cultivated research fields related to legal issues. e-Journal Lentera Hukum (eJLH) is a peer-reviewed journal administered by the University of Jember Faculty of Law, with issues in April, July, and December. The Journal publishes scholarly articles written by academicians, practitioners, and policymakers, specifically in the field of law and cognate disciplines related to legal studies. It lays an emphasis on the publication of works that are at the cutting edge of legal conversation by using theoretical, empirical, socio-legal, doctrinal, and comparative studies.